The fathers day lorry is very similar to most of the cars we've already done but to really make it feel like a proper truck is needed some mud guards over the wheels. It would be hard to laser cut something directly to go over them but thanks to the vacuum former I can laser cut some moulds and make some plastic arches to go over them instead. Now the arches can be covered with sugar paste to match the rest of the cake. This item wasn't actually designed or drawn by me, I did help out though. 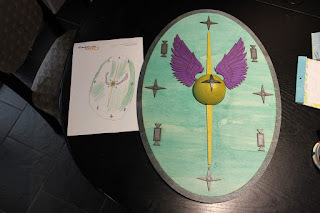 Eli was tasked with designing a Roman shield based on his trip to the Lunt Roman Fort. He chose to make a horseman shield which is rounded to protect the horses legs. He drew the whole thing in inkscape, picked the colours and we took it to the laser. The wings were actually drawn 7 years ago so it was nice just to be able to drag the files out of my archives and use them again. The shield boss was made from vacuum formed plastic. 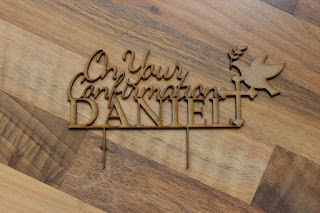 A quick laser cut from way back in May, this cake topper was to celebrate Daniels Confirmation (obviously). The spikes are a little bit fragile and spiky but it only has to go into the cake once right.